Talmud Master... like its name implies will help the user Master the Talmud. Talmud Master will train and guide you through the "give and take" of Talmudic debate. It will systematically analyze the components of a Sugya ( A Gemara discussion or debate).It will help you understand key phrases and how the Talmud uses them to signal the flow of thought. 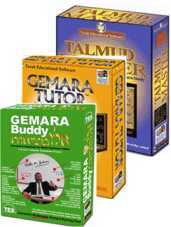 3 Great Talmud Tutor CD's in one bundle! 1. Gemara Tutor will build your Gemara Vocabulary.